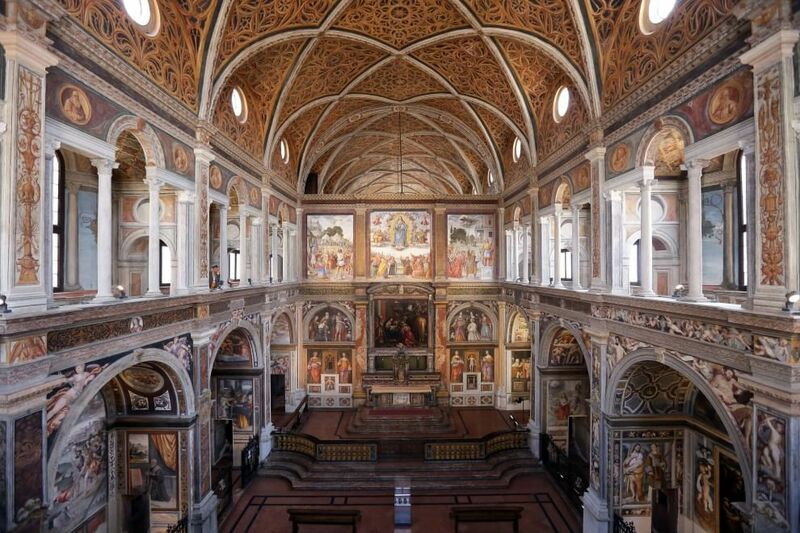 Italian tour books and journalists will often call a church which is particularly impressive for its artworks “the Sistine Chapel of ” such-and-such a place, period or artist. The Scuola di San Rocco may be referred to as “the Sistine Chapel of Venice”, the crypt of Anagni cathedral as “the Sistine Chapel of the Middle Ages,” the Scrovegni Chapel in Padua as “the Sistine Chapel of Giotto.” The city of Milan abounds in impressive churches and artworks of every kind, notwithstanding the terrible damage it suffered in the Second World War, but the “Sistine Chapel of Milan” is certainly the church of San Maurizio “at the Greater Monastery,” formerly its principal houses of Benedictine nuns. The nave and sanctuary of the public church. The nuns’ choir was originally separated from it by a grill, but this was turned mostly into a solid wall in the time of St Charles Borromeo, increasing the strictness of the community’s enclosure. The monastery was founded in the Carolingian era, and included a church building that was much older, but the current church was begun in 1503. It is divided into two parts, one for the faithful and another for the nuns, who were quite strictly enclosed. 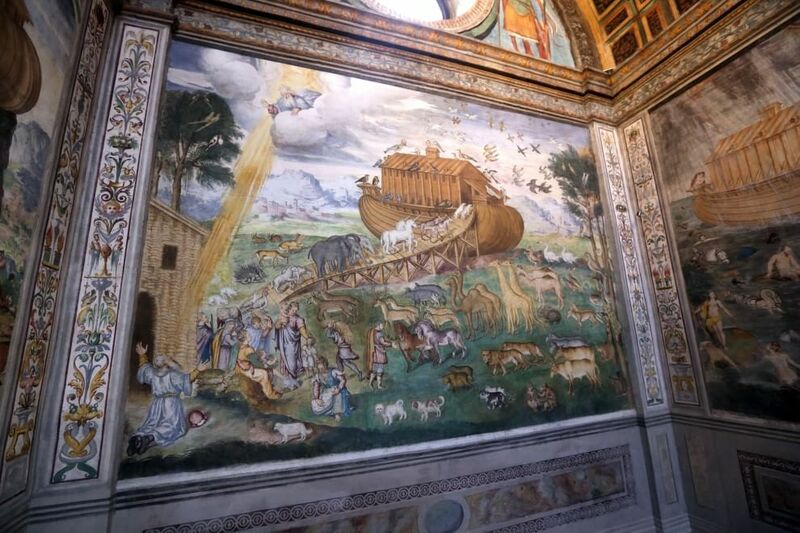 By 1509, the basic structure of the church was completed, and the decoration of the church and its many side-chapels began, mainly through the patronage of the Bentivoglio family, four of whose daughters entered the convent, and other families associated with them. 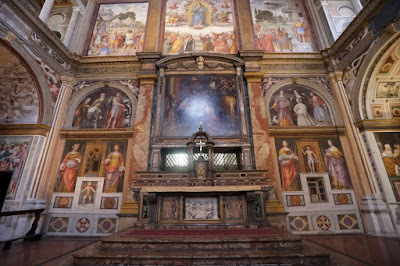 The painting of the church would continue though the rest of the 16th-century; the result is an impressive, if somewhat uneven, collection of frescoes, beginning with the disciples of Leonardo Da Vinci, chief among them Bernardino Luini, continuing through the early Mannerists, and completed at the end of the 1570s with the façade, the frescoes on the counterfaçade, and the main altarpiece for the nave of the public church, by Antonio Campi. 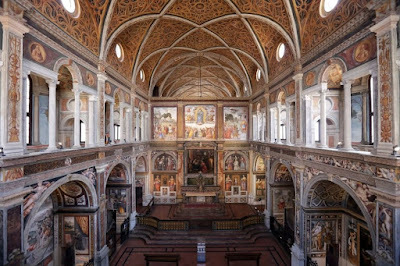 Since the suppression of the convent by Napoleon, the complex has been put to a variety of secular uses, and its two cloisters have been destroyed; it is now part of the Civic Archeological Museum of Milan. 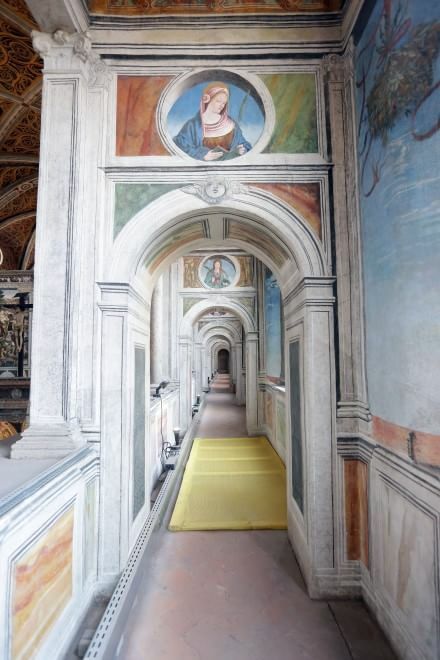 With the building of modern streets next to it, (one named for the painter Luini), the structural integrity of the building has been compromised by traffic vibrations, and the frescoes have been damaged by excess humidity. However, beginning in 1986 with an anonymous donation made for this specific purpose, the church has undergone a complete restoration, which has just now been brought to a successful conclusion after nearly 30 years. 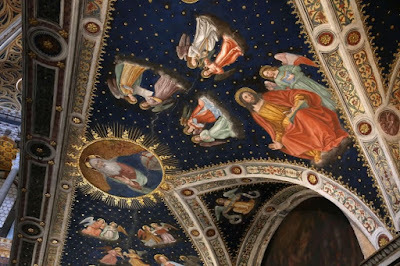 The upper gallery of the church, with images of female Saints. 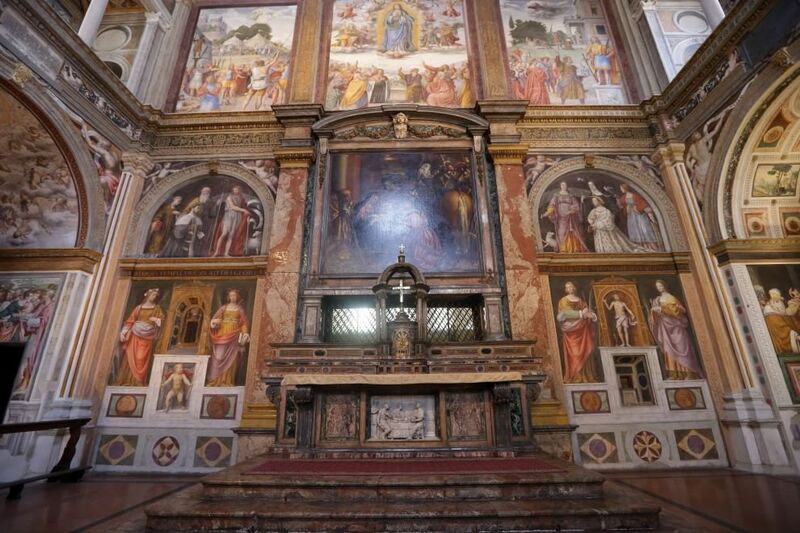 A closer view of the main altar in the public church.